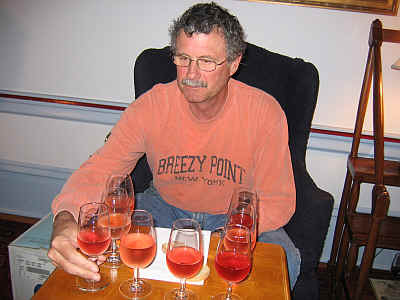 As the season turns towards summer, host Justin Williams wanted to have a look at a crop of dry, pink wines. 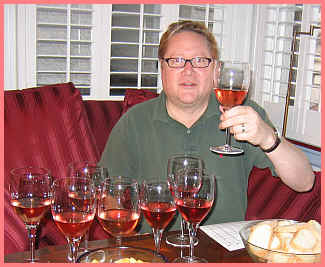 Over the years, ros had been viewed with disdain by many wine drinkers. 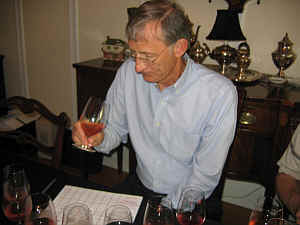 Some looked down their pointy noses at pink wines as being solely for neophyte wine-drinkers. Of course, in Europe, many people find ros to be a most enjoyable accompaniment to summer meals. 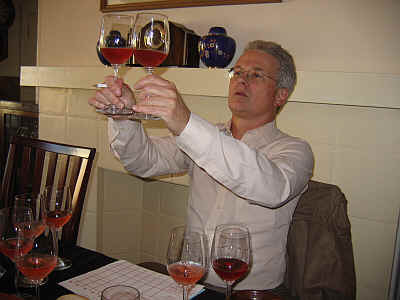 The wines tend to be low in alcohol, not oak aged, dry and refreshing on the palate, not to mention the wallet. 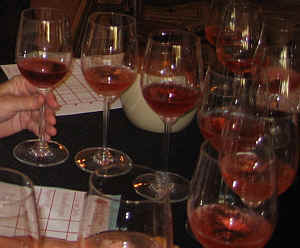 Vintners seeking to produce ros wines tend to pick early to have a 'normal' level of alcohol, say 11% or 12%. 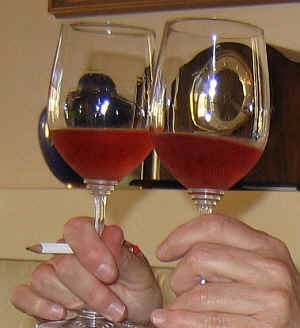 Wines tend to be vinified with the idea of immediate drinking. 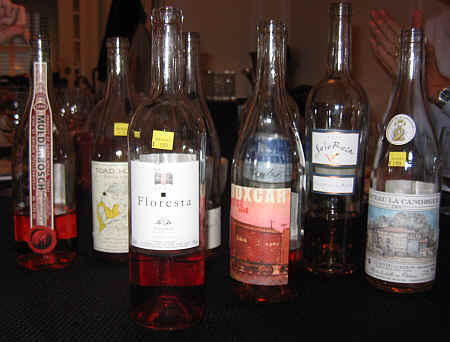 A number of California winemakers make ros as a 'sideline' product, bleeding off juice from their red wine tanks. This allows them to produce more intense reds, having a larger skins-to-juice ratio. 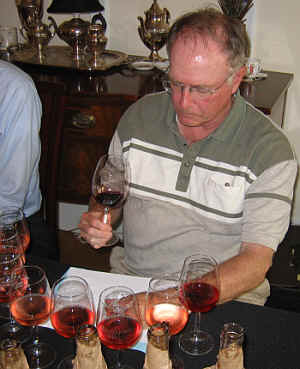 Of course, since the grapes have been harvested to make 14% (or more) alcohol, it's not surprising that the pink wines are often rather potent, too. We had a nice range of wines, a couple from France, a Spanish, a South African and 4 from California. I found this to have a great nose, showing lots of berryish fruit. It's deep in pink, cherry color. The wine is rather dry and shows nice fruit on the palate, though it's lean and light...exactly what ros is all about, though in a beauty contest such as a blind-tasting, it takes a back seat to some of the more 'plush' wines. I have it one-and-a-half stars on my three star scale. The nose of this wine shows rather ripe fruit and it's a bit heady and potent. Light in color. I found the overall impression of this wine to be 'hot' and for my tastes, not-so-hot. A good effort, but not a lot of character here. One star. We've long been fans of this estate and this pink wine. Over the years it's become a shade lighter in color. It's another example of a ros that's delightful on its own, but it's not a "wine-tasting wine." Orange/pink color. Fruity and stony notes on the nose with a faintly yeasty tone. I described this as a potentially good blend for a sparkling wine. It's lean and crisp. One star. Bright pink in color with an orange tone, the fragrances here are mildly earthy and lightly vegetal rather than fruity. It's a bit coarse on the palate. A shade 'hot', too. The wine opened nicely, but it was my least favorite of the set. Nice pink color, this is a cherryish, fruity and almost slatey and stony on the nose. It's dry and reasonably crisp. The flavors lean towards a chalky character...dry. Nice. One-and-a-half stars. Beautiful color...reddish pink. The wine seemed to have a bit of SO2 and after it sat in the glass, it showed a more berryish fruit element. Dry. Crisp. Nice and light, tangy, berryish and good...One star. Bright pink in color, this wine is quite different from the rest of the wines in this line-up. It's almost woodsy with lovely berry fruit up front. The wine is berryish on the palate and the oak shows up there, too. It's not excessively oaky or woody, but you will probably sense this element in the background on both the nose and palate. For a wine-tasting, I found it enjoyable. The Spanish wine was a shade darker in color than the rest of the bottles in our tasting. Deep cherry red in color, the nose offers lots of berry fruit. It's more like a light red than delicate pink wine. The berry fruit is deep and delightful on the palate. Wonderfully refreshing. Two stars.